Now in its thirty-second year, Jazz Forum Arts is one of the country’s premiere not-for-profit jazz presenters. Jazz Forum Arts brings top quality, live jazz music to wide audiences throughout the New York metropolitan area and is committed to the appreciation and understanding of this distinctly American art form. Jazz Forum Arts features established, emerging, and under-recognized artists as well as regional, national, and international musicians. Presenting jazz in its multifaceted styles, Jazz Forum Arts offers audiences Progressive and Bebop, Latin & Brazilian, World Music, Rhythm and Blues, New Orleans, Traditional, Swing and Contemporary Jazz. During the Fall and Spring, Jazz Forum Arts produced its Jazz at the Tarrytown Music Hall series, for twenty-two years, featuring Billy Taylor, Lionel Hampton, Betty Carter, Gerry Mulligan, Sonny Rollins, Clark Terry, Dave Brubeck, and the Count Basie Orchestra. Jazz Forum Arts has also produced concerts at Peekskill’s Paramount Center, Purchase College’s Performing Arts Center, and Valhalla’s Kensico Dam. Jazz Forum Arts produced 13 years of the Riverside Park Arts Festival in New York City, three years of the Berkshire Jazz Festival, and eight years of the Sunnyside Jazz Festival. In NYC, Jazz Forum Arts has presented at The Town Hall, Symphony Space, The Michael Schimmel Center at PACE Downtown, the Beacon Theatre, NYU Skirball Center and since 2005 at Jazz at Lincoln Center. Jazz Forum Arts presents three dozen concerts each summer as part of our Free Summer Concerts Series, which features concerts held outdoors in several Westchester County, New York towns and villages. This summer marks our eighteenth consecutive year of two dozen or significantly more free concerts in Westchester County and the environs. We are proud of contributing to the cultural landscape in the New York metro area, and of the audiences we have cultivated and brought to the music, focusing on underserved communities. Our founding board members in 1985 included David Amram, Dizzy Gillespie, and Wynton Marsalis. 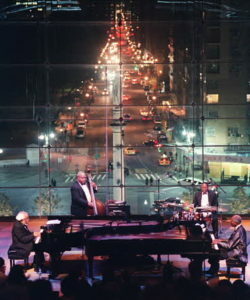 Jazz Forum Arts is proud to have been awarded our 6th grant from the National Endowment for the Arts, which helped fund the National Public Radio broadcast of Cedar Walton & Barry Harris on WBGO’s Toast of The Nation (New Year’s Eve), documenting our long-running Piano Summit concert series at Jazz at Lincoln Center’s Frederick P. Rose Hall. We are extremely excited to open our new Jazz Forum club venue in Tarrytown in June, 2017, which will be Westchester’s premier Jazz club, presenting the finest in Jazz and Brazilian music, as well as a rotating exhibition of local artists. On June 13, 1992, Mark Morganelli inaugurated “Jazz at the Music Hall,” with “Swing Summit” featuring Harry “Sweets” Edison, Frank Wess, Al Grey, Dr. Billy Taylor, Milt “The Judge” Hinton and Oliver Jackson. Jazz Forum Arts has continued and expanded upon that initial offering, presenting 150 concerts in 22 years at the historic Tarrytown Music Hall. Some of the artists we’ve presented include Dizzy Gillespie, Sonny Rollins, Mercer Ellington, Dave Brubeck, Lionel Hampton, Chuck Mangione, Pat Metheny, Betty Carter, Wynton Marsalis, Bobby McFerrin, The Manhattan Transfer, Chris Botti, Cassandra Wilson, Spyro Gyra, Dianne Reeves, Hugh Masekela and many more. Jazz Forum Arts is a 501© 3, not-for-profit arts presenting organization, whose mission is to present top-quality events to the public at little or no cost, while enhancing the appreciation of Jazz, America’s pre-eminent indigenous musical artform.